Last Friday night we had a transcendent experience. In New York for a quick business trip, we booked last minute tickets to see John Cameron Mitchell reprise his role in Hedwig and the Angry Inch. Having miraculously scored front row seats to the 10 pm show, it was impossible to keep our expectations in check. This was going to be amazing. We had no doubt. And we go into any experience with our sites set so high we are always, inevitably, bitterly disappointed. The sparkly crutch that was carried onto the stage when the Angry Inch took their places, should have been the first red flag that something was amiss. The fact that JCM was in bedazzled high top sneakers rather than the iconic Hedwig gold boots was a sure sign that he wasn’t fully recovered from the injury that had sidelined him long enough to have Michael C. Hall step into those glittering glam rock platforms. It took a while to notice the knee brace complimenting the torn thigh high stockings on Mitchell’s left leg. This "slip of a girly man," at the age of 51 no less, had seen better days. You would think that what was to come would be a bitter disappointment for two mega-fans who knew every word of the soundtrack and who once shared a bucket list moment sitting directly in front of JCM at a sing-a-long Hedwig screening in L.A. some years earlier. How could he possibly live up to the hype, when he was clearly going to spend half the show sitting down and calling upon his loyal servant Yitzhak to bring him a crate to rest his weary foot? Looking back at YouTube performances of Neil Patrick Harris, Michael C. Hall and Andrew Runnells climbing up walls and doing leaps off set pieces during their own versions of “Wig in a Box” drove home the moves that Mitchell was unable to attempt. But his lack of overt flash, did not lessen the impact of his performance in any way. It’s impossible to imagine him giving any more than he gave or dazzling the crowd anymore than he did. In fact, watching those other admirable turns by some of Broadway’s finest leading men, only made us realize that as good as each one of them was in the role, no one will ever fill Hedwig’s shoes — be they glittery gold platform boots or silver studded black kicks. To talk about the night without mentioning Lena Hall would be inexcusable. Half way through the show, we both wondered how her subtle yet charming performance had earned her a Tony Award. Not that she wasn’t great, but certainly other’s had tap danced and flaunted jazz hands in far showier exploits. But that restrained subservience, giving way to her showgirl metamorphosis left no question as to why she rose above the others for Broadway gold. 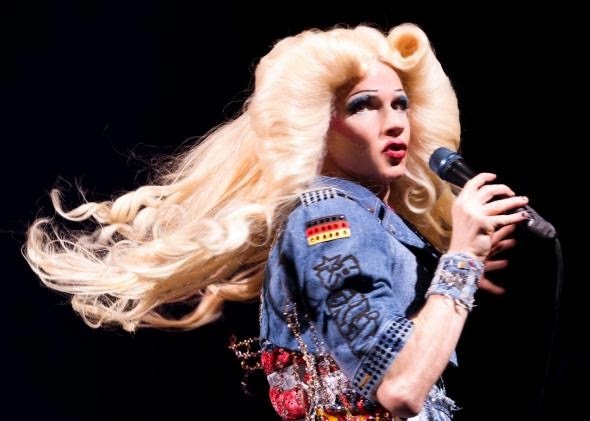 For those who have a chance to see the creator before he calls it quits, get yourselves to the Belsaco Theatre in New York to catch Hedwig and the Angry Inch before time runs out.